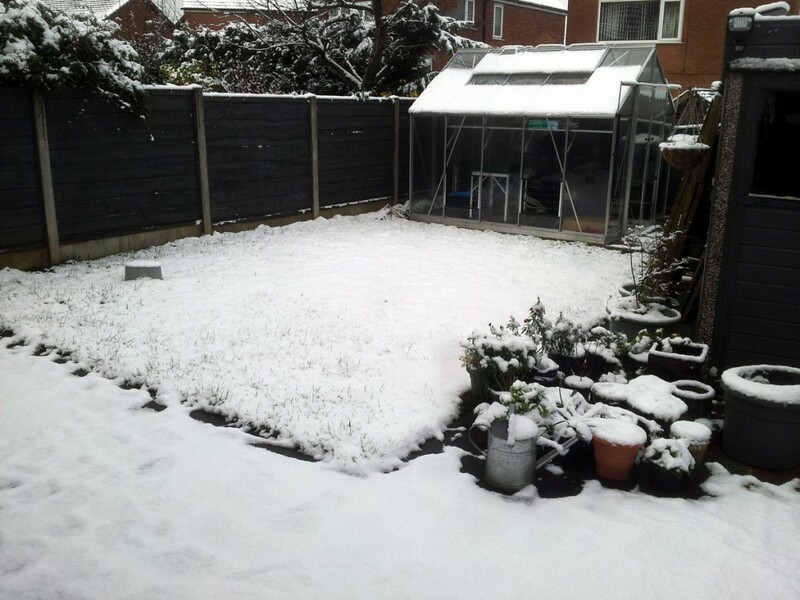 No sign of any sort of garden under a brief blanket of snow. …which all-but disappeared overnight. Otherwise though, it’s been as soggy as the allotment. We do have a few early flowers in the pots that we brought with us from our old house. A few very pale primroses (Primula vulgaris), some bright white cyclamen (Cyclamen hederifolium), a few deep red wallflowers (Erysimum sp., too many to narrow it down) that have lingered through the winter, some white hellebores (Helleborus orientalis, I think) and another hellebore species with very small, dainty green-tinged flowers (Helleborus viridis, most likely). Just a very small pot-display at the moment, but with many more to come in due course. The big news this month is that we’ve taken a major step forward on the Cottage Garden Project planning front: a consultation with local garden designer and Tatton Park RHS Gold Medal winner Joan Mulvenna of Garden Design Manchester. Joan has a fantastic eye for making the best use of a small space like ours, and within a couple of hours she was able to give us a completely fresh perspective on how we can adapt the space to make it as attractive as possible. It was a great session, well worth Joan’s very reasonable consultation fee. I’ll be revealing our future plans in more detail in a fresh blog post once Jo and I have had a chance to incorporate our own ideas into Joan’s outline and get them down on paper. That’s it for January. Hopefully we’ll have a bit more to report at the end of February. Thanks Sue, it’ll probably take a few years to get it to where we want it to be, but we’ll enjoy the work along the way.